"...At the going down of the sun, and in the morning. We will remember them..." a portion of the poem, For the Fallen, written by Laurence Binyon in September 1914. Hundreds of Bridgewater and area residents surrounded the town's cenotaph in Veterans' Memorial Park, November 11 to do just that, remember. This Remembrance Day was extra special, marking the 100th anniversary of the signing of the Armistice that ended World War I. "This has always been one of the nicest ceremonies and the people in Bridgewater always turn out," he said. "This year being the 100th anniversary of the Armistice of 1918, it is a special time. Some of my relatives' names are on the monument now that we lost over the First and Second World Wars. "Bridgewater does themselves proud every year and we have to instill the idea of remembrance into our young people, so they can keep it alive," added Sorette. "They said at the end of the First World War that it was the war to end all wars, but as we know, it wasn't and it's still going on today. Hopefully some day I would like to see it in my time, that we will have peace." Bob Henderson, Sergeant of Arms for the Bridgewater Branc,h served in the navy from 1951-56 in Korea; the air force from 1956-66; and with the U.S. Navy Seabees from 1973-77. "We have to remember because of the people who have gone over and fought and died to save this country," he said. "Bridgewater has done a good job of helping people remember." Tony Brinson, a 20-year veteran worked in communications from 1979 to 1999, and he also served as a paratrooper for six years. "It is an important service, especially for the young people that were here," he said. "It's incredible to see that many that came out. Brinson is originally from Newfoundland, but he and his family now live in Bridgewater. As people gathered during the brisk Sunday morning, they heard the drum beats of the Bridgewater Fireman's band leading a parade of Legion members, cadets, veterans and youth groups to the park. Once settled, a drum-head ceremony was performed. The ceremony is steeped in tradition. For centuries, soldiers about to go into battle asked for divine help and guidance in what were known to be difficult times ahead. To do this, the regimental padres conducted the service in the field. This called for a platform upon which the padre could place his Bible and other pieces of equipment he required to conduct a formal service. Lacking any other platform, the regimental drums were put into service by stacking them in layers. In Bridgewater, flags were laid on top of the drums, representing the three elements of the Canadian forces ­- the air, land and sea - on top of the "altar." Emcee John MacDonald went into detail regarding each element as it related to the Canadian effort. He then welcomed everyone to the service. "Every year since 1926. We have gathered here to remember, honour and thank all the men and women who have sacrificed in all of the wars and conflicts that allow us to stand here today as a free people. 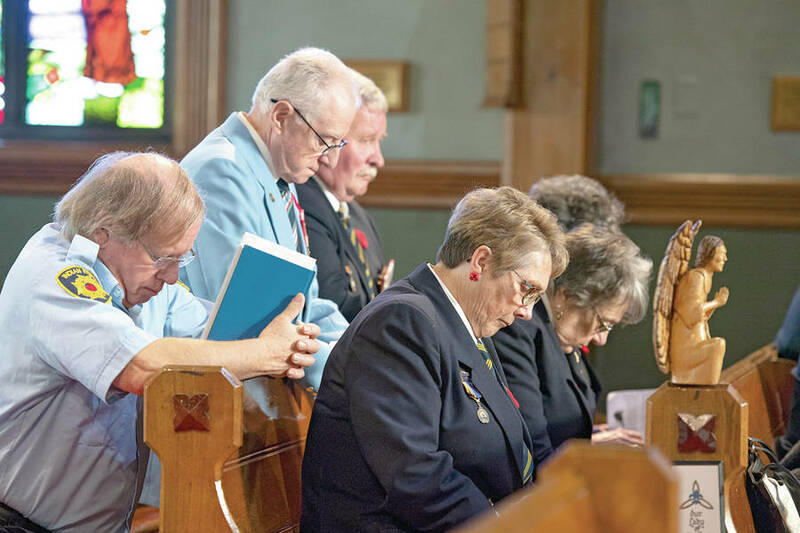 "While remembering all who have served throughout all our history, especially the 102 men and women from our community who have been lost in wars over the years and their names enshrined in our cenotaph... Then, as now, freedom is not free." Sharon Jackson, led the singing of O' Canada, followed by the last post by bugler Laura Allen. A flyby of a military plane had those in attendance looking to the sky, at exactly 11 a.m.
Two minutes of silence for the fallen soldiers was held followed by the lament, played by piper, Ron LeBlanc and the rouse, once again by bugler, Laura Allen. The roll of the fallen comrades was read, as people bowed their heads in honour. Along with a few hymns, the program included the reading of the poem, Remember, by Private Tess Vachon of the West Nova Scotia Regiment. Similar ceremonies took place throughout the South Shore, including in Hubbards, Chester, Mahone Bay, Lunenburg, and Liverpool. Bells in communities across Canada rang out 100 times as the sun slips under the horizon to mark each years since the armistice. The "Bells of Peace" initiative started bells ringing in Newfoundland at 4:29 p.m. local time and the wave continued across the country for more than four hours until sunset in B.C. The initiative emulated the event that happened when the Armistice was signed in 1918.